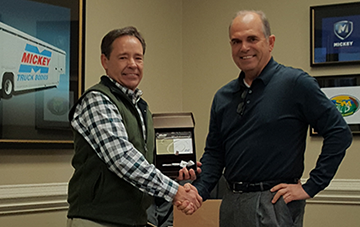 Dean Sink (right) congratulates Jim Hiatt on his 30-year anniversary at Mickey. Jim “Jimmy” Hiatt, VP National Van & Vending Sales, celebrated his 30th anniversary at Mickey Truck Bodies, making him one of the longest tenured teammates at the company. Jimmy began his Mickey career in 1986 as Territory Sales Manager in the then-fledgling Van “Division.” He was promoted to Vice President Sales – Van & Vending Team in 1995. Under his management the team branched out aggressively from its original dry freight line to include refrigerated and full-service vending bodies, and also became the world’s largest manufacturer of moving bodies. All told Jim has spent 38 years in the transportation industry in various sales roles. “Jimmy has been the consummate salesperson by representing our products accurately and professionally to provide the best value and most efficient delivery solutions to our customers,” says Dean Sink, Mickey President. “He took our van body business from a local position to a national presence. Some of the most popular brands in America are now delivered on a Mickey van body.